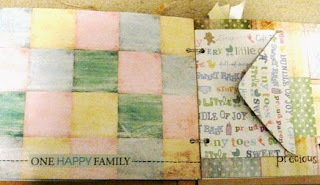 I made this little "new baby" mini album for my sister-in-law, Carleen. She is a scrapbooker, but hasn't had time to scrap in awhile due to her new job -- raising little people. I bought a plain, wooden album with cardstock pages, something like a 10 x 8. 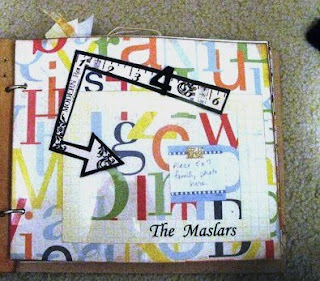 I chose this playful paper (Paper Studio's Baby Animals) for the cover and used mod podge to adhere it. 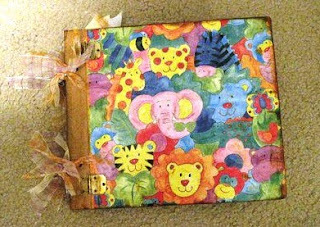 I replaced the posts with rings to bind the album and covered the rings with tons of ribbons. I inked up the edges around the outside and inked the inside cover completely since I didn't cover it with paper. Then... 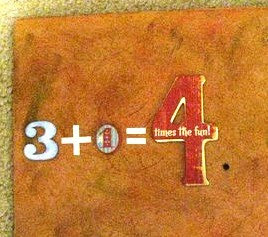 I stole this frolicsome idea from Ali Edwards' mini album: "3 + 1 = 4 times the fun." Isn't that cute? Carleen and Steve's family has increased to four, so the album focuses on that. The numbers are from K& Co. except the 3, it's an American Crafts Thicker that I colored a little with my chalk ink. The remaining photos have sticky notes that I put on to tell Carleen what size photos to add. I should have removed them for these photos, but I forgot, sorry! Page one is for a 5x7 family portrait. Paper Studio Alex's Alphabet, Scenic Route's Blue Grid Graph, & a Scenic Route die cut arrow. I emphasized the 4 with a leather number probably from American Crafts. 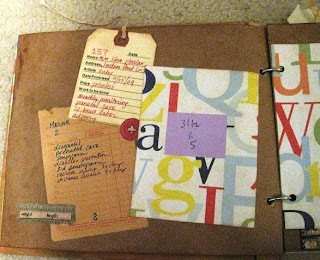 Pages two and three are for documenting Carleen's labor process, I'm all about journaling. Left page -- my favorite -- introducing the new "Say It In Pearls" 3D embellishment, you can barely see it, a pearl flourish along the bottom. Mmmm, I love that thing. It's by Prima Marketing. The right page has an hour by hour to-do list sheet from a daily planner refill pack. Carleen can document the day of labor, hour by painful hour. The triangular rub-on at the bottom made me think of the new heartbeat entering the world. Paper Studio's Graph Dots. The ugly bright blue is just background to frame a photo. The next page I did in my preferred antique vintage style, which is not very baby-ish. I included a vintage claim check with hospital, date, etc. info. for Steve and Carleen to claim their item (a new baby). I included a vintage waitress order form that details out the various appointments Carleen had with her prenatal care. Then there's a spot for a photo and the opposing page has a vintage envelope for Carleen's memorabilia, a Bible verse and room for another photo. One of the pages contains a mini-mini album in which to document one week in the family's new life. 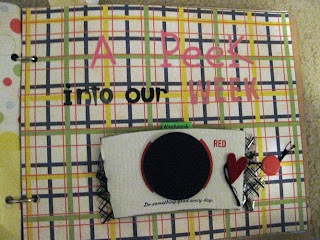 I took the title from a Creating Keepsake's classname "A Peek into our Week." 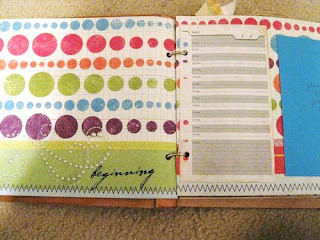 The paper is Paper Studio's Alex's Plaid and the opposing page paper is Alex's Random Dots. For the mini mini album, I used a Starbucks Red coffee sleeve. Under the place for a circle photo, it says "Do something good every day." I used Paper Studio's flocked brad in a heart shape (Yum-O!) with black thread to connect to the other brad & secure the book when closed. When open, this book features one day of the week on each page with places for Carleen to add 2x2 photos. 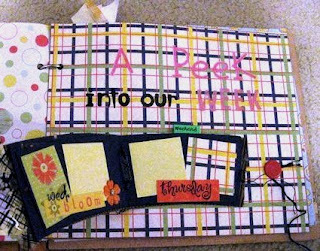 Letters for "A Peek into our Week" come from Bo Bunny, Rusty Pickle and American Crafts. Flowers in the mini album are Bling Blossoms from Bazzill. I usually make these coffee sleeve mini albums as gifts for women to carry in their purse as a brag book, it's a little too thick to put in an album like this. These two pages are DaisyD's Lullaby papers - Lullabye Checkerboard and Patchwork Yellow. The envelope for memorabilia is covered with Paper Studio's Baby Words and I added some rub-on quotes at the bottom. 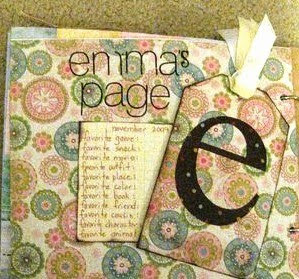 The last page is for the 4 year old big sister, Emma. It's covered in yummy My Mind's Eye Graceful Circles paper. I love this new line of paper! I distressed an index card that pulls out and lists Emma's favorite things such as snack, game, outfit, place, friend, book, etc. Just a page to acknowledge what Emma's life is like at this moment in time. Gosh, I love that paper, I'd like a scarf in that pattern. There ya go. 8,552 hours later, you, too, can have a lovely little baby album. OK, you can probably do it quicker than I, the time is just an estimate. Ready? Set? Go! Link back and show me your mini albums! Very nice, you did a great job. I haven't been scrapbooking lately, I need to get back into it! What a wonderful gift! You are very talented and creative--plus you took the time to do all of this. Great job. Great job Val, they will love it. I keep wondering where you got your artistic ability, surely not from your Mother! Thanks, Corina! I always lean towards shabby chic and vintage. Can't break out of the box. I need more of your cards - they are so beautiful. Are you selling on Etsy?